Are you confused by the multiple uses of the same name, OneDrive? This article provides a quick rundown of where you might see OneDrive, including storage and apps. As consultants dealing with Office 365 we get a lot of questions that have simple answers, ones that are difficult, and ones that bring a knowing smile and start with “OK, this is interesting”. The OneDrive and which version of OneDrive we are talking about question (for there can be only one – sorry) is in that latter category. OneDrive is mentioned frequently when talking about Microsoft Office 365, and rightly so, it is an incredibly useful tool and especially so with the latest releases. But new clients, and some of those exploring beyond traditional SharePoint are confused by the multiple uses of the name. This article provides a quick rundown of where you might see OneDrive. So, to begin we can break this down into two categories, storage, and apps. The first category covers storage space, specifically cloud storage space. Microsoft provides storage space called OneDrive through several of their services and works in a similar manner to Google Drive and Dropbox. There are two occasions where you might be provided with storage space know as your “OneDrive”. You may be given OneDrive Personal storage when you sign up for some of Microsoft’s consumer or home services, such as an Outlook (or Hotmail, or Live) account. The two most common allocations of OneDrive Personal we see are through signing up for a Microsoft Email account, or Office 365 Home or Personal. 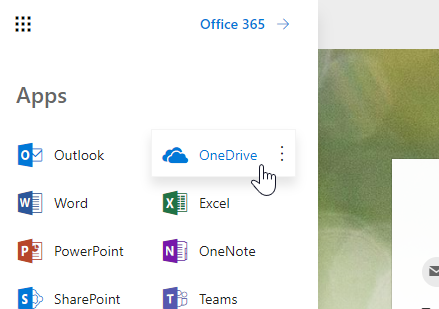 In both cases, when you are logged into the service you signed up for you’ll see the option to open your OneDrive through the ‘waffle’ icon in the corner, as illustrated below. In all these cases you will have signed up for a service at home, not through your business or employer. 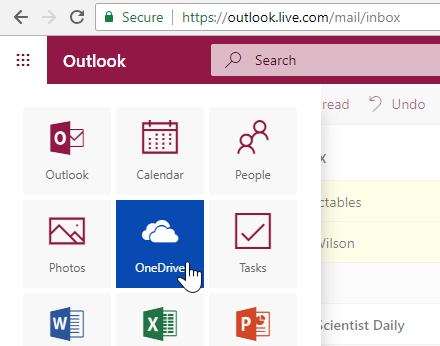 When an organisation signs up for one of the Office 365 business plans, OneDrive for Business is activated for the licensed users of that service. This works in the same way as the personal version, but the storage and content are controlled by your organisation. When in the browser it looks very similar. The key is to recognise which system you are logged into and that OneDrive Personal is not the same space as OneDrive for Business even though it shares a name. In both cases when talking about OneDrive we are talking about the cloud storage space you have for your files. The second category we want to look at covers the apps, also helpfully called OneDrive, sometimes more helpfully known as the OneDrive Sync Client. The apps serve the purpose of synchronising your files between the OneDrive cloud storage and your devices, such as a laptop or mobile phone. As with cloud storage, the OneDrive desktop app (Windows and Mac OS X although here we are focusing on Windows) can also be split into two cases covering the Personal and Business versions. The purpose of the OneDrive app is to synchronise OneDrive Personal and OneDrive for Business files between your cloud storage areas and your computer. You can install OneDrive as you do other apps on Windows, and you may find it is already installed. When installed and running you will see one or two icons in your Windows taskbar, as shown below. OneDrive Personal is represented by the white cloud in the in the Windows taskbar notification area, while OneDrive for Business is represented by the blue cloud. Each instance of the application has its own settings. The result is that you see locations in Windows Explorer denoting the local sync locations. You can see below my OneDrive for Business storage as the cloud icon in Windows Explorer. Once synchronised you can open and save files to the folders just as you would on your device storage but now everything is also copied to, and available from, the cloud. Any changes in your cloud storage also copy down to your machine. In my illustration, you will notice there is a status icon against folders and files in the OneDrive area. This is a great feature now in the more recent releases of the app for Windows 10 and it indicates if there is a current local copy or if you are ‘saving space’, but I’ll talk about that in a future article dedicated to the app. 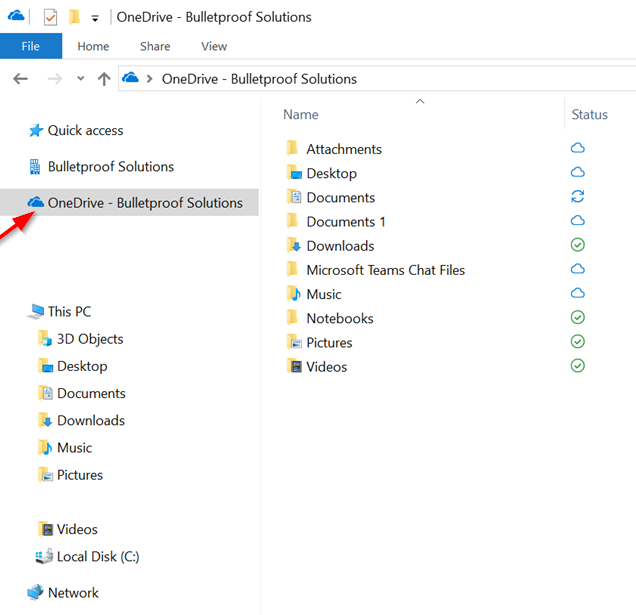 The major advantage of using the OneDrive app is that for a user they get to use the familiar Windows Explorer interface for saving and editing files, but all content is saved up to the cloud where you can collaborate and share easily. Typically, you will only see one cloud icon, the blue one on your work device, or the white one on your home device. Governance covering the use of OneDrive in the workplace, retention, discovery etc. is an important topic which I will cover in a future article. The OneDrive for Business sync client is also responsible for synchronising SharePoint libraries in the O365 environment. So, if you have access to a SharePoint site in Office 365 you may see the following button in your libraries. The Sync button allows you to take a local copy of this library and keep them synchronised in the same way you can synchronise your OneDrive files. In the Windows Explorer screenshot above my SharePoint libraries are represented by the office block icon just above the OneDrive entry. If you are using SharePoint the OneDrive app becomes doubly useful as again it allows the user to upload and edit files in a more familiar way, and allows offline copies for travelling, and so on. This topic is an interesting one and as with any great feature there are some downsides and worthy of a more detailed future post. Finally, in the apps section, we have OneDrive Mobile. Microsoft has been pushing their anywhere access model for a while now and the mobile apps are a big piece of this. Just like the Windows app, the mobile apps allow you to access your files in OneDrive Personal, OneDrive for Business, and SharePoint, from a mobile device. The app is available in the Google Play Store (for Android) or the Apple App Store (for iOS). The mobile app will also allow you to connect to both personal accounts and business accounts. We’ll look at the options and settings in the OneDrive app in a future article in a lot more detail, so you can manage your synchronising and connections to SharePoint and lots more. Questions? Submit your question(s) below. Shaun is an experienced Senior Consultant with 22 years’ experience in delivering IT solutions. His role is to help clients with their transformation projects providing experience and expertise, especially in governance and information management. Shaun’s clients include organizations of all sizes in Government, education and the private sector. He is a subject matter expert in SharePoint (MCITP) and Microsoft Office 365 cloud solutions, a Project Management Professional (PMP)®, enjoys being an IT trainer (CTT+ and MCT), and is a member of AIIM (Association for Information and Image Management) and ARMA.